Read the "Customer Comments" link for more about the joys of playing this banjo! Overall length, including the strap button: 39"
Width of the neck at the nut: 1 3/16"
The fit and finish of this SX guitar company banjo is first class. I was pleasantly surprised with how nicely made this banjo presented, and the gig bag is ballistic nylon with padding and a pocket for accessories. It took about 30 seconds to flip up the bridge, put the strings in their seats and a quick tune for a really pleasant and solid sound. Now all I have to do is learn how to do more than strum the open chords, heh heh heh heh. Pictures can't do this banjo justice.... it looks like it should cost twice as much. Good for you for reading the reviews before you buy this! I neglected to do that, but I am not at all disappointed by this product. Looks great, sounds great too! I am very impressed. I will admit that when I received my Banjo some of the tuning pegs were slipping and not able to hold up to the tension of proper tuning. If I would have read previous reviews I would have know all about this, but I didn't so I contacted the seller thinking I would need new pegs, but they told me this happens sometimes when the shipping company isn't careful. (I'm sure having it shipped to the opposite side of the country had a hand in the bumpy ride) They were willing to replace the parts, but the gentleman I spoke with suggested that I tighten the screws on the peg heads, so I did and now they hold beautifully. This may be common knowledge to a more seasoned player but, being a novice myself, this was great to know. I love this banjo! 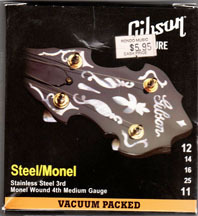 The frets and the inlays are smooth and the finish is lovely. I cant believe how low the price is for such incredible quality! This could easily be sold for way more than they are asking. I bought this last year as a Xmas present for my husband. He hasn't put it down since and it's been over a year. This is a great beginner banjo and very sturdy. Sounds nice. Question: Is the back open or closed? 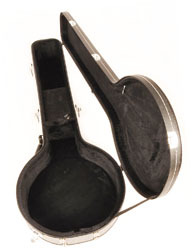 Douglas BJC-200 Banjo Case$39.95 On Sale!